If you personally know me, or have ever seen me out around the city, you know I am not . . . how can I say this . . . a “health nut.” I like pizza, and pulled pork, and really just carbs in general. I enjoy white wine, and beer, and double vodka tonics. Yes, I work out and do enjoy it, but to me, life is more exciting like this. For the most part. After a weekend in Avalon last month, filled with a few too many brews, bagels etc., I needed to calm my life down a bit. I had always heard of “cleanses,” and asked a few of my nutrition pals for their thoughts (which were mixed). I did some more research on my own and decided to give one a go. The team at Garden of Flavor (which you can buy in this area – keep reading!) had kindly sent me a three day cold pressed juice cleanse to try out. Seeing as this was my first time cleansing, and I had pretty low expectations for myself, I decided to give it a try for two full days. I kept a little “diary,” if you will, about my three days (two days of drinking juice + one easing my way back to real food) and thought that would be the best way for me to share my experience with you. 6:45am – Black coffee. Typically, you don’t drink coffee during a cleanse. But GoF’s PR rep shared that she keeps it in her cleanse rotation, so I went with it. 8:25am – Here goes nothing! Juice #1 is Goji Pineapple. I really love the ginger and mint. 9:30am – Finished the first juice. I have lots of meetings today. My stomach is growling in those meetings. 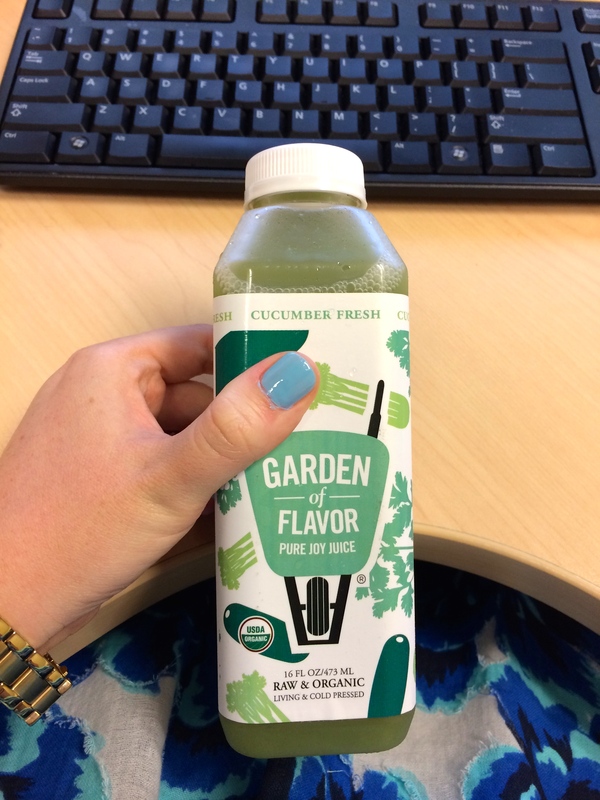 11:40am – Juice #2 is Cucumber Fresh. It’s very light and grassy. Is it too early to want pizza? 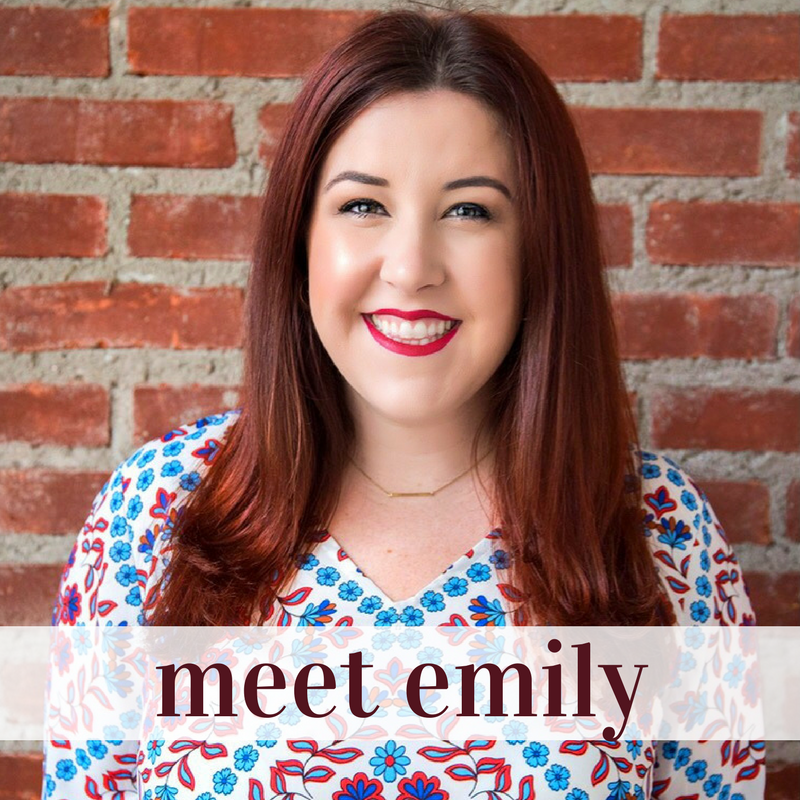 Yes, Emily, it is. I am drinking lots of water instead to prolong the juice comsumption. 3:00pm – I’m surprised how long I lasted before getting into Juice #3, Mean Green. I like the name. This one is also pretty light, despite having five pounds of leafy greens in this very bottle. 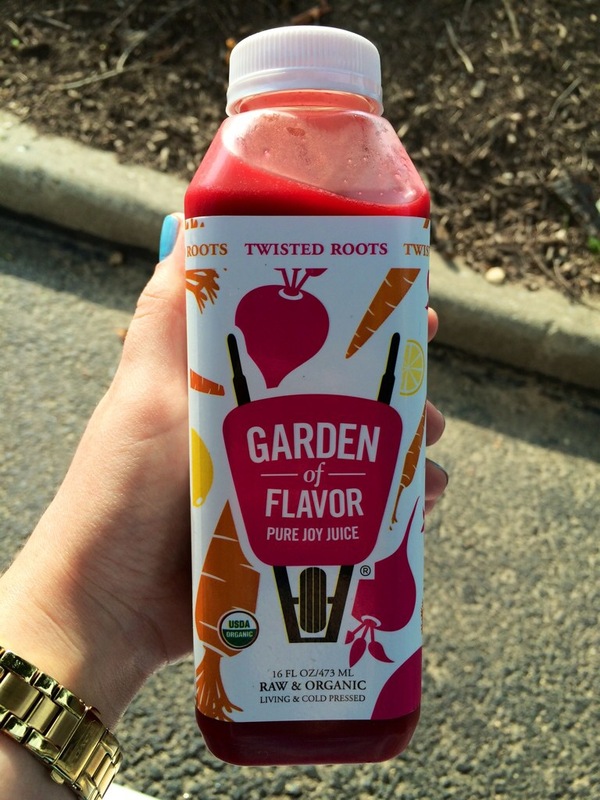 5:30pm – Juice #4 is Twisted Roots. I am drinking it on my drive home from the office. It is super sweet, but I like beets, so I’m enjoying it. Drinking these juices is really making me rethink what the hell I eat everyday. Seriously. 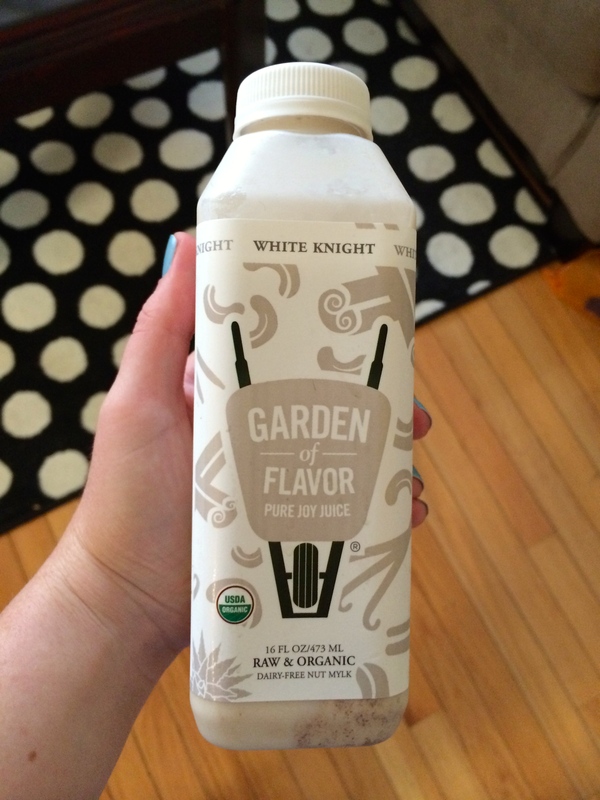 7:30pm – Juice #5 is White Knight. 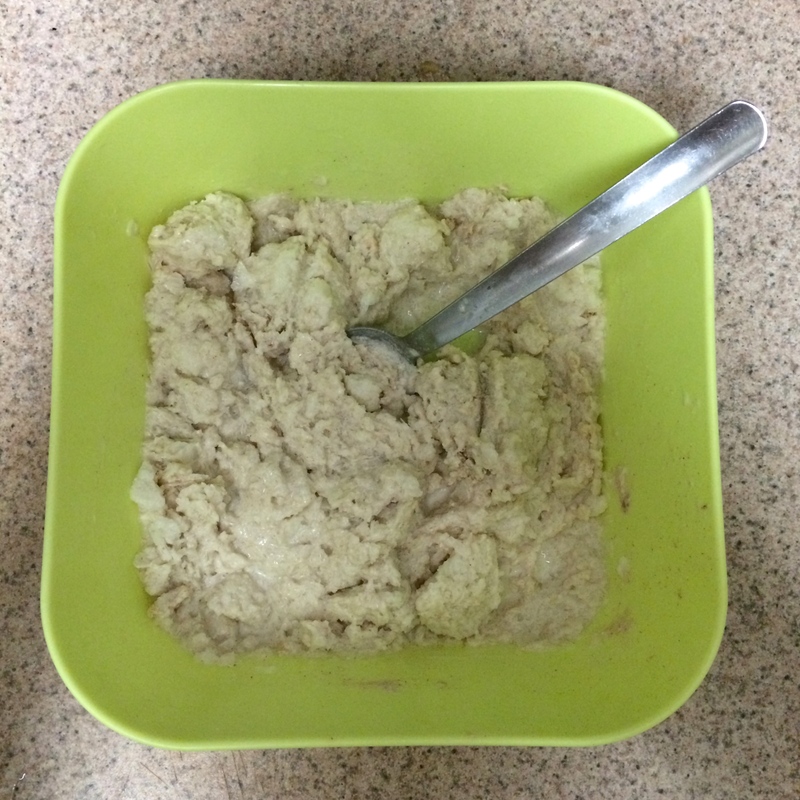 This one is pretty creamy, and a few people from GoF recommended I freeze it and eat it like ice cream. Well, I am an idiot, and I froze it IN THE PLASTIC BOTTLE. Let’s just let that sink in for a minute. Now, I am basically sawing my way to the juice with a knife. (I do not recommend this.) 7:55pm – Finally sawed through the bottle. This was an interesting method, but let’s just be honest . . . despite the vanilla and cinnamon flavors, juice will never, ever be ice cream. 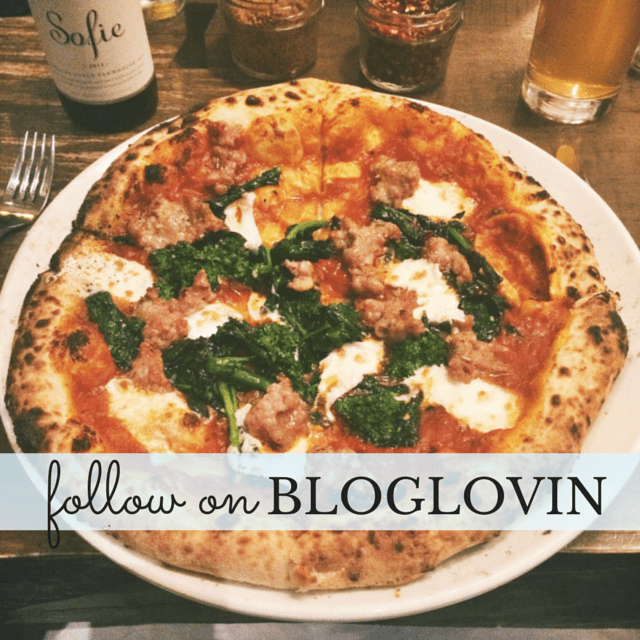 8:30pm – Let me just say, social media friends, why are you ALL ABOUT the food pictures?! I hate being on Instagram today. 9:20pm – I’ve finally freaking made it through the day! 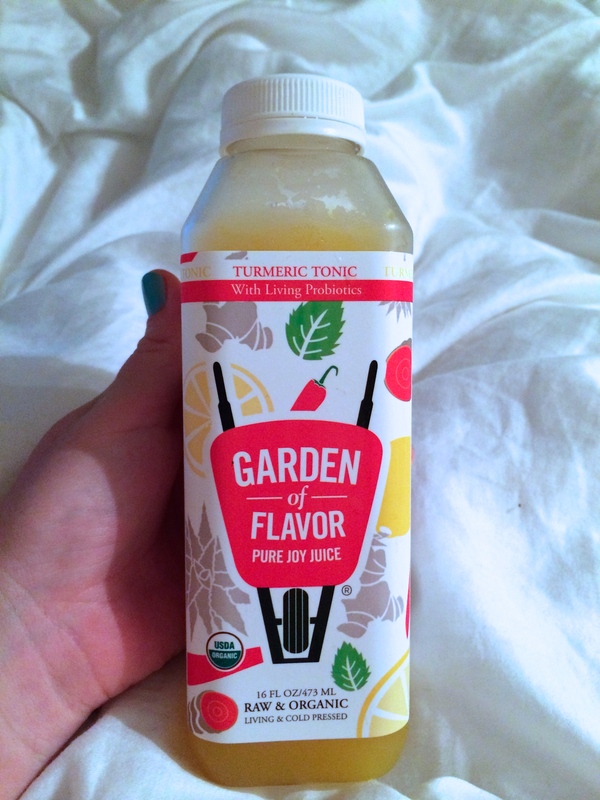 Juice #6 is Turmeric Tonic. It’s basically a spicy lemonade. I enjoyed it, but couldn’t finish it. And now I’m ready for bed. 7:00am – Well hello world. I am feeling OK this morning. I am having a smaller cup today, but I still need that coffee. 8:30am – Starting my first juice. I am really hungry. I just want an English muffin. 11:00am – Time for Juice #2. Someone eating SunChips in my meeting. I hate them and the SunChips. 1:30pm – Juice #3. I think I know what’s so tough for me. Food is exciting to me (obviously), and especially when I’m not as busy and have time to ponder my food choices, these juices are just, a little uneventful. 3:45pm – Juice #4. A moment of self reflection: I need to get to a place where I do not eat without thinking each choice through. I have more control over my body than I thought. 5:00pm – I feel like today’s Twisted Roots has a lot more carrots than yesterday’s. I hate carrot juice. It’s taking me so long to drink. 6:45pm – Tonight is Movie Club, and because I like to inflict torture upon myself, I pick Chef as our flick for the evening. I am drinking Juice #5 through the movie. Because, of course, Cuban food does not hold a candle to my faux milkshake drink. 9:15pm – I couldn’t finish my last juice again tonight. It’s time for slumber. DAY 36:15am – I made it!!! I feel really good today. Refreshed and almost like, if I had the self-restraint, my body could easily do another day. To get back into eating real foods, I need some soft fruits and veggies. I am kind of worried about my options at work. 9:00am – Not much in the soft fruit and veggie department for breakfast. I had an orange. 12:15pm – FOOD. Glorious. FOOD. 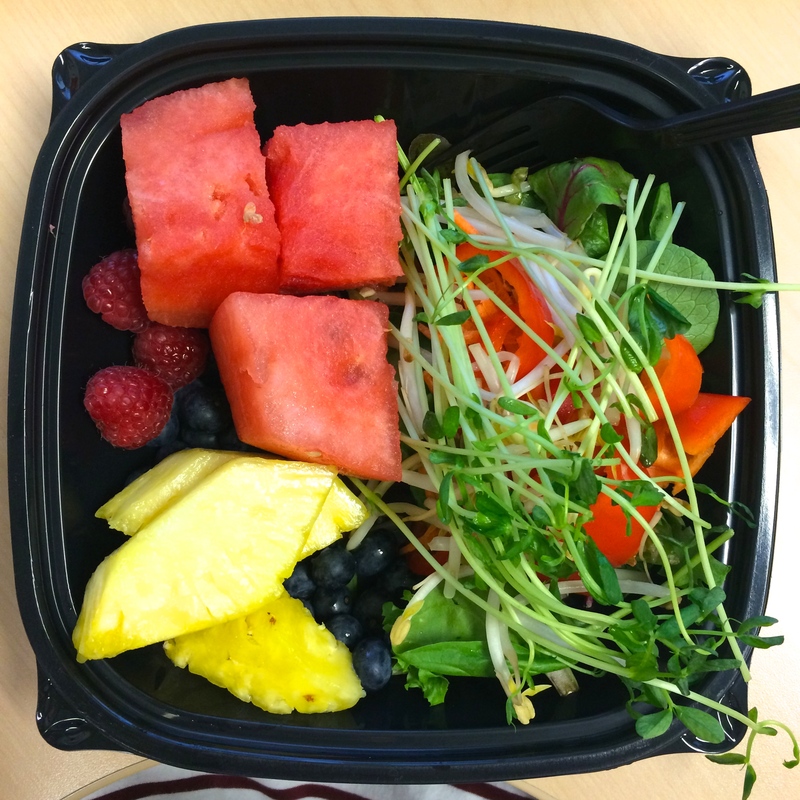 My lunch is filled with fruits and a salad. I am having a few tiny pieces of grilled chicken on the side, even though it is not called for the day you’re coming back from a cleanse. But, I am craving it. Lunch is great. 6:30pm – Ah happy hour. Despite the temptation, I am going with water. 7:00pm – Good freaking thing I did. I am starting to feel lightheaded. It’s time for food. I get a Good Dog Salad and dig in. It is delicious. 9:00pm – I am home from happy hour and I am starving. Whatever, I am having some pistachios. Good night. The cleanse was a really unique experience for me. It showed me I could actually control my body and my mind and do something like this. I did lose a few pounds when all was said and done. In addition to the lack of excitement (for someone like me), one of the hardest parts was trying to find actual full days when I didn’t have dinner plans or an event after work to fit the cleanse in to my schedule. As you’ve read, I don’t claim to be a health specialist, so you have to know if a cleanse is the right thing for your body. The Garden of Flavor website has some great resources on why you should cleanse and other FAQs that helped me during the process. 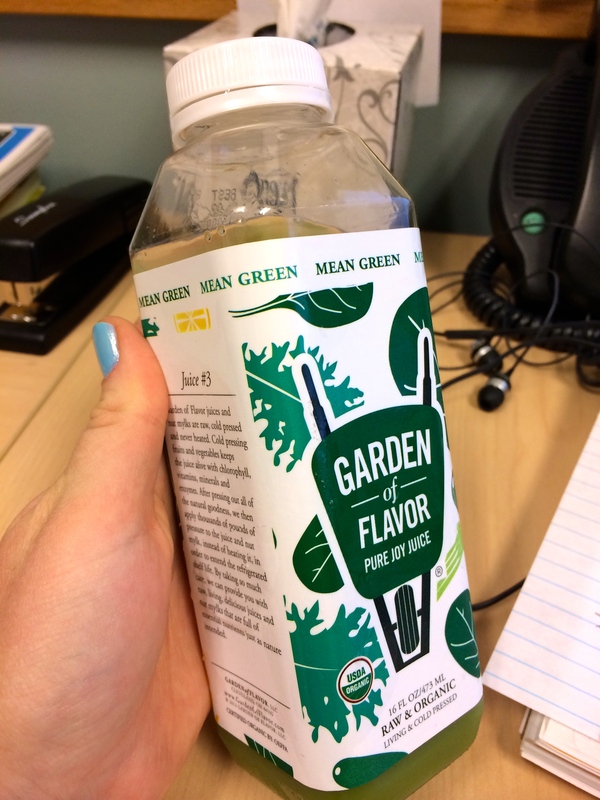 If you’d like to try the Garden of Flavor juice cleanse, you can currently get it at the Whole Foods in Plymouth Meeting, PA & Marlton, NJ. 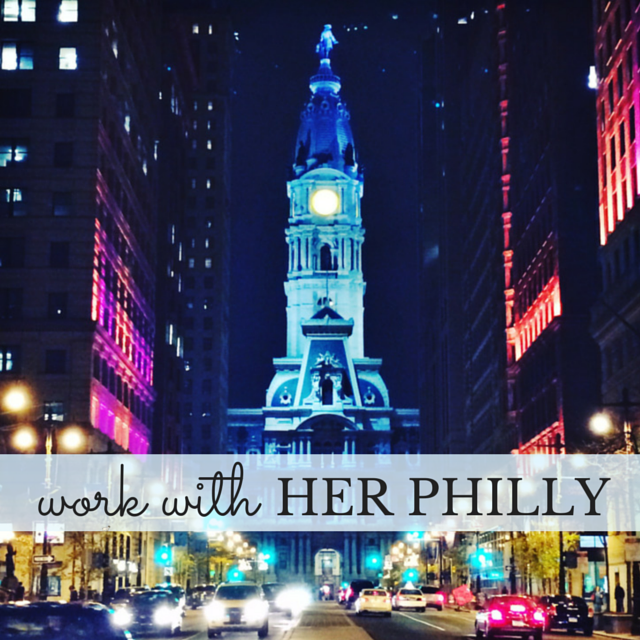 GoF is hoping to be in the Philly stores in the next few weeks, so I will keep you posted when I get word they’re there. The average cost is $44 for the six-pack cleanse (one day) or $7.99 per juice. What do you think ladies, have you ever done a cleanse? Thoughts? 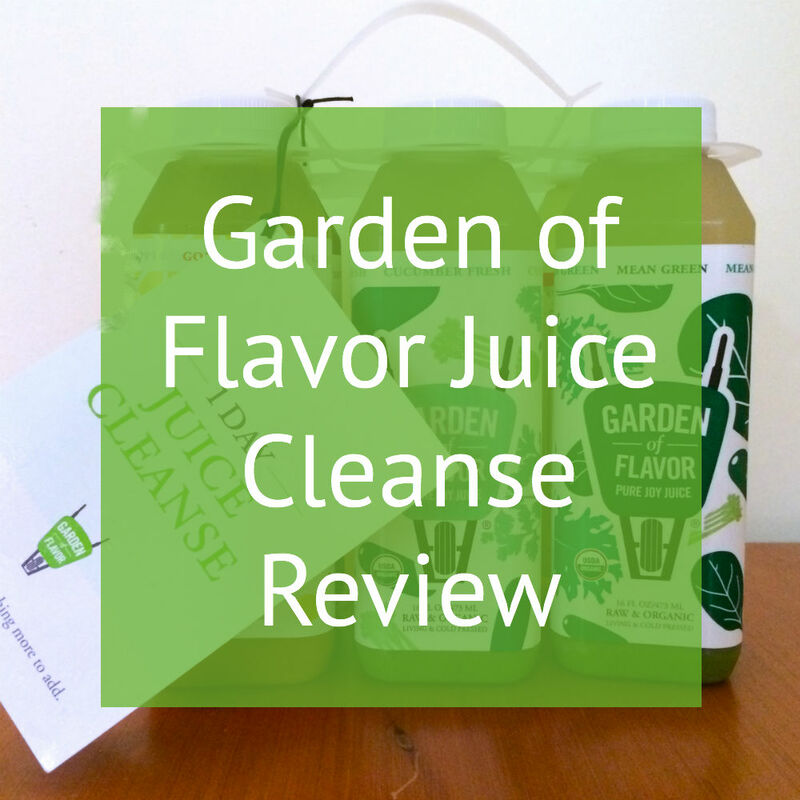 Disclosure: I was sent a three day juice cleanse from Garden of Flavor to try. All opinions are my own.